Do you remember the last zip you made with your backpack? Was it as liberating as the end of your last class? Was it as mindless as taking out your laptop at a coffee shop? Did it make you heart skip a beat when you locked in your passport? The noise of my backpack’s zipper has become synonymous with good vibes and good times. That sack of cloth and zippers became my lifeline during my recent trip to Thailand. 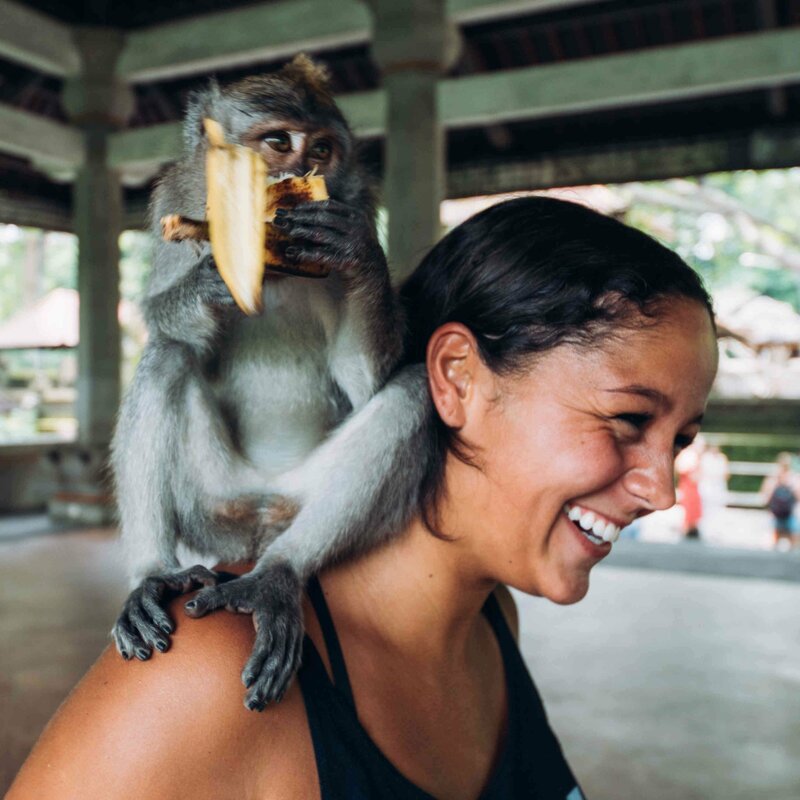 I have never understood what it means to “travel light” but when I signed up to go on a nine-day tour through Thailand I figured my 25-kilogram suitcase was not going to cut it. How much did I really need? I challenged myself. My backpack became my one carry-on. When I stuffed in my last pair of shorts I realized that I would rely on this bag full of my life necessities for the next 9 days. When I got to the airport I felt liberated...just my backpack and I. Unlike any other trip I had previously taken I was on my own. 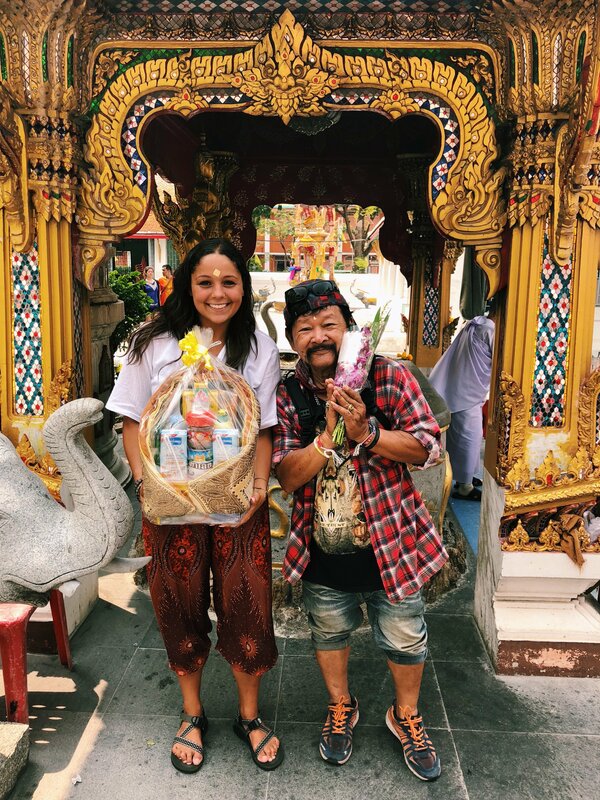 When I signed up for Thai Intro I was seeking an experience I couldn’t get traveling with my parents like I had in the past. I wanted to push my comfort zone to meet new people and take in a new place. That swirl of anticipation and excitement I felt waiting in the Sydney airport was unlike anything I’ve ever felt. The moment I felt overwhelmed with doubt I realized that I wasn’t in this thing alone. I knew that when I landed in Bangkok someone would be picking me up from the airport. I knew I would have a group of people to travel with. I didn’t know where I was headed exactly, but I knew the arrangements were taken care of. I knew I would be okay. When my flight arrived late in Bangkok the doubt re-entered my mind. Would “my person” still be waiting for me? The spotty airport Wi-Fi wasn’t of any help. When I made it past customs and arrived at the arranged meeting point I was greeted with a smile. My tense muscles relaxed and the weight was off my shoulders. My excitement came back. When we jumped out of our cab a group of people waved at us. It took a moment for me to process that these were ”my people” for the next week and a bit. Fast forward a couple hours and I almost forgot to check into my room because I was so caught up in meeting the most colorful group of people I’ve ever been around. There were couples from Canada, solo travelers from Sweden, and a dash of every other corner of the world. Our next few days would be spent exploring Bangkok together. Sensory overload…there is no other way to describe it. We ate. We explored. We got Thai massages. We got blessed by a monk. That, my friends, is something I could never even dream up. Our local guide Sompong and I! 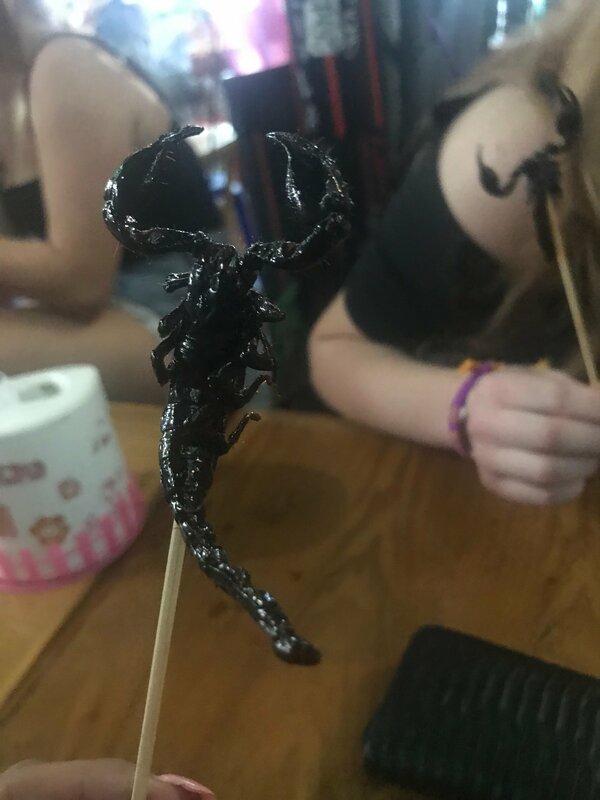 It wasn’t until my group cheered for me to bite into a massive scorpion on Khao San Road that I realized how much of an impact these people were making on me. They hadn’t known me but a few days and they were pushing me to live, to experience. Shortly after consuming my weight in Bangkok Pad Thai we started our trek to Khao Sok National Park. An overnight train (the best night of sleep I’ve ever had-no kidding) and a bus ride later we arrived in the park. Sound like a logistical nightmare to you? It sure sounded like one to me, but it proved to be the smoothest travel day. That was the first time I really took a step back to realize the work that goes into planning these trips. There is no way that I could have planned those logistics or found more entertaining travel companions on my own. The beauty of Khao Sok National Park was striking the moment I got out of our van. A landscape of impressive mountains and beautiful blue water met my gaze. We loaded up onto a long-tail boat and headed to our accommodation. On the way to our bungalows we even got to get out to go for a swim in the fresh water. Besides our group, there was not another person on the water. The secluded, private, off the beaten path feeling was such a contrast from the crazy streets of Bangkok. Good times spent on tubes at the over water bungalows. I didn’t know what to expect of “over-water bungalows” but my mind was blown. When our boat started to idle my eyes were fixed on a tiny community of little huts connected by boardwalks. I have never stayed in a place so unique in my life. It is easy to forget that you haven’t stepped on real land for hours. The bungalows provided us free time that allowed me to customize my experience. 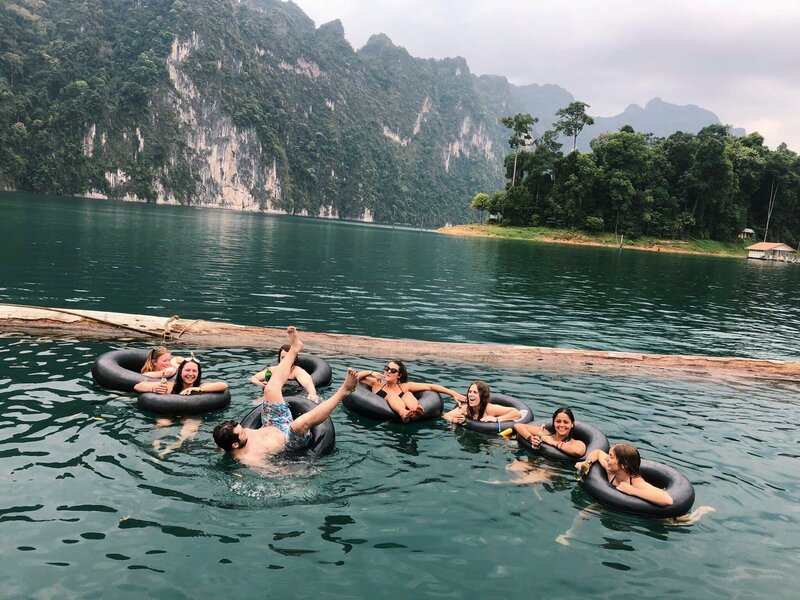 Personally I took to the free tubes and kayaks with my new friends, while some group members played card games or relaxed and read a book. We reconnected to reminisce on the day over dinner, followed by a boat trip to go monkey spotting. The following day we took off for Koh Phangan. 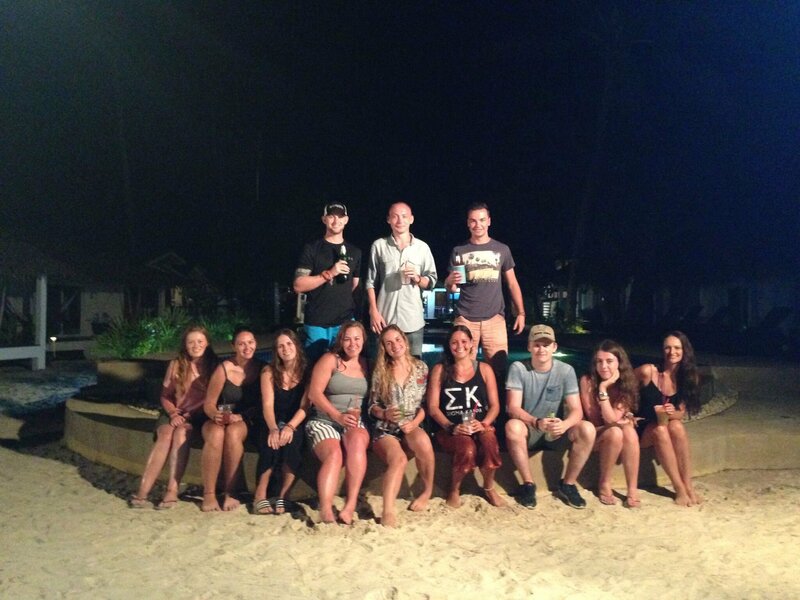 After spending some time in a ferry we arrived in Thailand’s famous full moon party island. Once again we were treated to shared bungalows but this time they were right on the beach, at a resort complete with an infinity pool and full restaurant. I’m a sucker for a nice beach and I was absolutely blown away. My new friend Annie taking in the infinity pool. To break up our time enjoying cheap drinks at the pool and getting massages we ventured out to do an island tour via boat. We stopped at breathtaking beaches and snorkeled along the way. Speaking of snorkeling, don’t turn down snorkeling in Thailand- I was so impressed by the fish!! One of our beach stops graced us with the “Jack Sparrow” a coconut with a splash of rum-now that is island life! 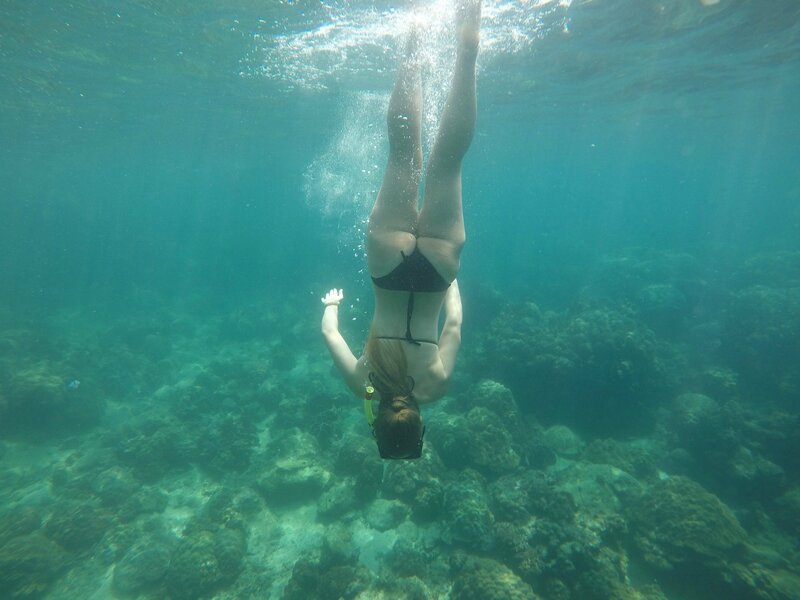 My friend Lyra diving down to see the coral. 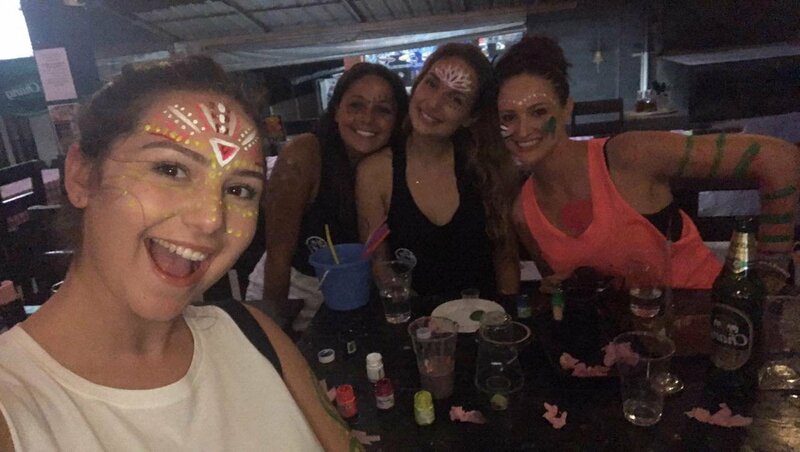 Though we did not visit during one of the famous full moon parties, we still ventured out to get a taste of Koh Phanagan nightlife. One night this meant sampling the local Thai cuisine at the Thong Sala food market. If you are a foodie, or even if you aren’t a foodie, this is a highlight. I had the best Pad Thai of my life, followed by delicious fresh coconut ice cream. Talk about YUM. Later on our night out at the beach was fire- figuratively and literally. The beach is full of lively fire dancers and travelers from around the world. Whether you choose to grab a bucket with a friend, sit back and watch the fire dancers, or both you are in for a treat. My personal favorite was petting the puppies that roam the island. New friends and I getting painted for the beach party! Soon our last full day together was upon us. Our group leader took the time to meet with each one of us to plan our onward travel. I thanked my lucky stars she did, because I messed up my planning. I was on a fixed timetable so I could not extend my time in Asia and I booked my transfer back to the Bangkok airport. That transfer included a flight to the wrong Bangkok airport. Rookie mistake. Had she not checked my travel plans I would have been out my expensive 9-hour flight. It was easy to get my new transfer booked, but I was out the money from the flight I booked incorrectly on my own. The lesson I took from it: live, love, and trust your tour guide. That final evening in Koh Phangan we traveled to a beachfront restaurant for our farewell dinner together. You could tell everyone was sentimental and nostalgic reflecting on what we had experienced together. In the morning we would go our separate ways, forever changed by what we had experienced over the last 9 days. Each of us shared our favorite memories, concluded by an amazing rap from our group leader Lucy. That night we went back to our favorite beach spot and shared our last night together. When I went to bed I stayed up thinking about all the nerves I had on my flight into Bangkok. 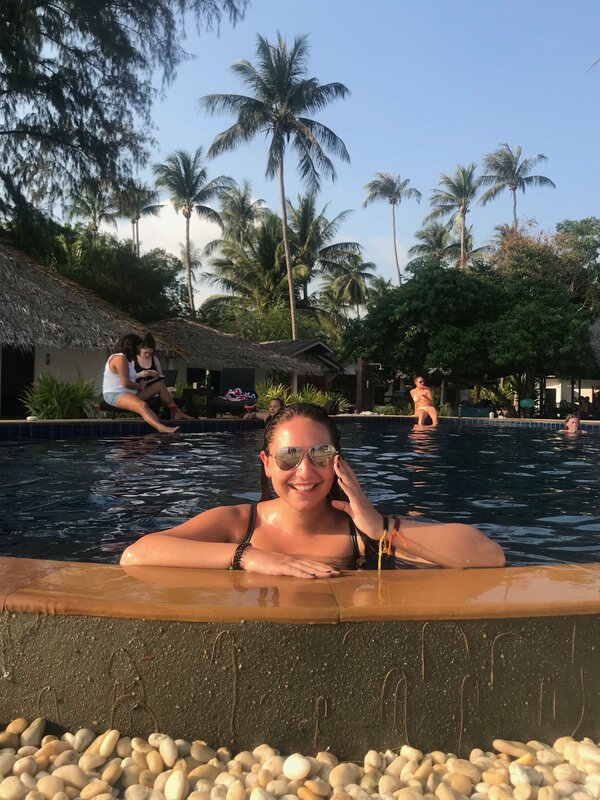 Over a week later and I had made new friends from around the globe, traveled all around the beautiful country of Thailand, and I never got “sick from the food, saw a snake, or got my bag stolen”. Those thoughts had not revisited my mind since I was on the flight that started my journey. The next morning some of my new friends took off to the Phi Phi Islands, others to Chang Mai, and some back to their home destinations. Remember how I said my magical group leader saved my life with my flights? My mistake gave me another day on the beautiful island of Koh Phanagan at the same accommodation our group had been staying at, Sarana. My group leader had helped me book another night and set up a trip to Mu Koh Angthong National Marine Park. What had felt like a world-crushing mistake had become another day in paradise. I even got my laundry done at the resort so I would return home with clean clothes! The next day I made my trek home. I took a ferry to the island of Koh Samui and flew to Bangkok to catch my flight to Sydney. It sounds like a lot, but my group leader had walked me through every twist and turn of my journey before I did it AND I could contact her if I needed help. These were the classic mom and dad questions. I never felt unsafe; I was always with a group of people that had my back no matter what. If anyone would have needed medical attention we had health insurance and they would have been seen in the best hospitals. Luckily, no one in my group ever had a problem. Even after I left my group, I had a point of contact that could help me out of any sticky situation I could have come across. The other topic of conversation was value. I personally loved that I didn’t have to worry about constantly pulling out cash to pay for the accommodation or transport. The only thing I really needed cash for was the uncovered meals and drinks. To add to that, out of curiosity, my parents looked into what cost would be like for them to go to Khao Sok National Park on their own. The cost of that alone, for 1 night, was nearly equivalent to the cost of my entire 9-day trip. Booking with a company that runs tours year round and fosters relationships with accommodation and transport partners in each part of their trip is unbeatable as far as value is concerned. 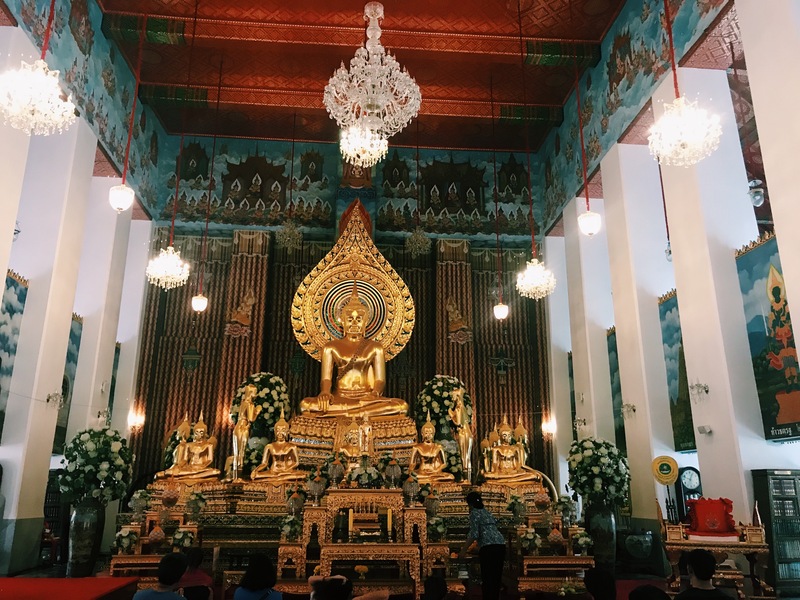 My 9-day trip to Thailand goes down as the best trip of my life so far. There is no way my trip would have been the same without the stress free flow of the things I experienced with the people I met along the way. To boil it all down, sometimes life is simple. All you really need is a happy place, great people, and an average pack to get the job done. Place. People. Pack. Those are the three essential P’s to the trip of a lifetime. Sound like a trip you can get behind? Interested in having the time of your life? Check out Thai Intro!